I have always loved photographs of pears; especially the one’s that are poached. But I have never had poached pears before. The only form of cooked pear that I have ever tried are grilled ones. Therefore, yesterday I decided it was time I poached some and what do you know it was not bad! Have you seen some of the pictures online of desserts with pears. Hm.. they are delicious to even look at. I may still be leaning towards grilled pears but I am sure when I master this art by adding sherry like Nisha has done here or add chocolate and ice-cream like Helene, you can see pictures here, my leanings may be flipped. This far, what I have loved most about poaching pears is the aroma. It permeated every bit of my apartment yesterday and it was delicious! The combination of cinnamon, ginger, lime, cloves and pepper corn boiling and simmering with pears releases an aroma that cannot be explained. It was sublime, believe me! Yes! Surely, the biggest high for me from poaching pears is the fragrance so far. And I will do it again, and again even if it is only to get the house smelling like the way it did yesterday. But the next time I will add wine or orange while simmering and serve it with chocolate and vanilla ice-cream. Either ways, I have arrived in the poaching business. If you are interested in poaching read on to know how I did this. I also tried the chocolate-cake-in-a-mug yesterday and loved it. It was easy peasy like it suggests and for a microwave anything it was soft, moist and delicious. You can find the recipe here on our site. 1. Heat water and sugar in a pan which can hold 4 pears. 2. When the sugar dissolves slide in the pears and all the spices. Squeeze the lime in as well. 4. Cook like this for about 20 minutes and pears should be poached. You may check insert a fork to make sure the fruit is cooked. 5. Serve with ice-cream or cake. thanks for the mention :) yes once you get the whole poached pear thing going, its kinda hard to stop, leave alone the zillion photography options. Its also a great dessert to serve at parties esp cos you can make it a day ahead and the flavours would catch on so much. A delicious dessert option! Nisha's space has quite a collection! I love many of her dishes! Never tried this before,sounds a great dessert..will surely give this a try. Beautiful and so elegant is the word for this poached pears...simply irresistible! Awesome pics as always! 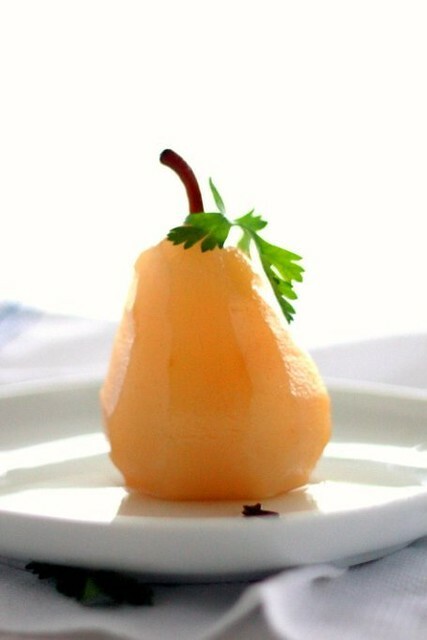 poached pears is a great idea!...I will have to try it!...it looks beautiful! Classic and beautiful...there are endless ways to capture that piece! Wow, Delicious poached pears, love the clicks! 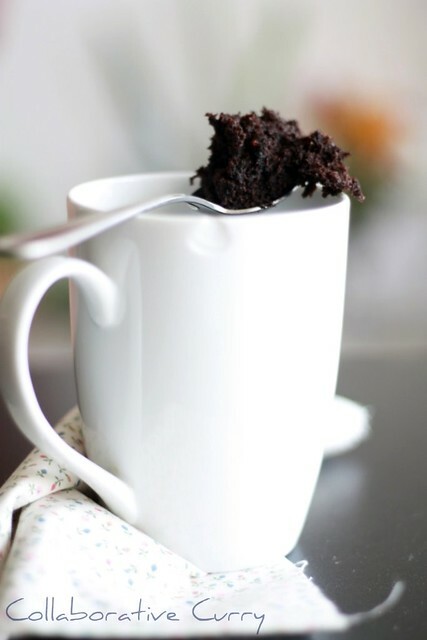 Cake in a mug looks very tempting! Excellent looking poached pears. Clicks look so wonderful . Feel like almost touching it. Now that is something I have never tried before. 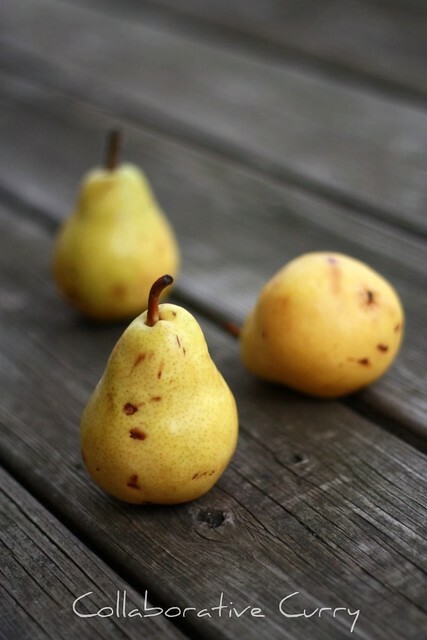 Fabulous poached pears,am yet to try them..Beautiful clicks;. The pictures are for real, looking good. Did you learn photography before? Woww... Lovely one.. looks too good !! Beautifully clicked, tht looks so yum! I've never eaten poached pears either but they definitely seem like extremely delicious, decadent treats! Love it...the pics say it all...very delicious..
Sunitha, I always wanted to get into the poaching thing, but I fear it may taste like boiled fruit in sugar syrup. How exactly is the taste and texture of the fruit after you poach it? Is it like mushy on the tongue? 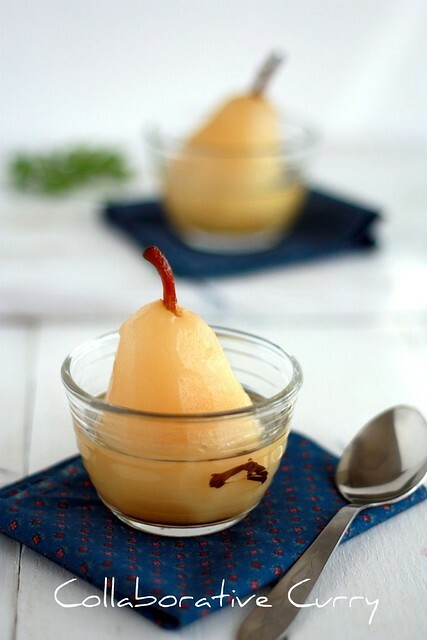 Yummy and tempting poached pear..
Poached pear and ice cream would be the most elegant dessert! That is a beautiful recipe without wine! Yummy pears and the second pic is simply awesome. Such a beautiful picture, the peaches look gorgeous. Excellent dessert. Healthy, beautiful and delicious. Oh i have been eyeing poached pears for long time, they look so special and classy, love 1st shot!